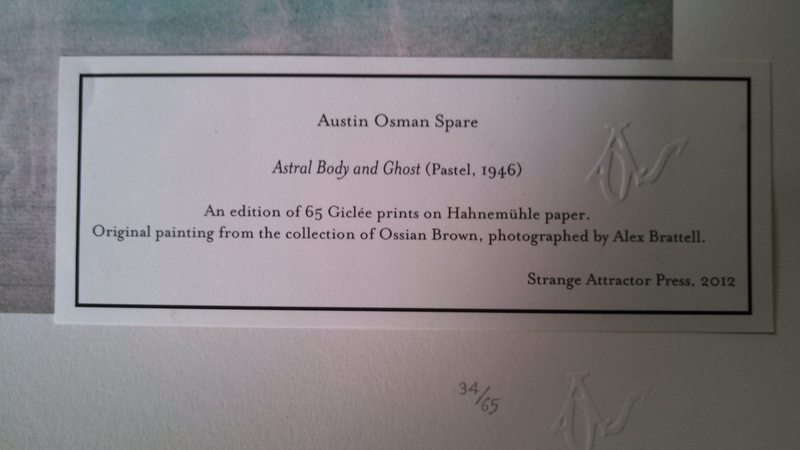 Continuing our year end efforts at de-materializing for 2014, Liminal Analytics: Applied Research Collaborative is offering up to the fires of fundraising one of our favorite office companions – a fine art print of Austin Osman Spare’s Astral Body and Ghost from a print edition put out by Strange Attractor Press in 2012. This offering has some particularly noetic resonance for our Managing Director, David Metcalfe, and it’s with great excitement that we are including this in our current active meditation on dissolution. Way back in the late 1990’s, when Austin Osman Spare was beginning to get more recognition due to the efforts of Robert Ansell and Fulgur Press, Metcalfe had an odd semi-lucid dream during some experiments with dream yoga techniques culled from the now archived Grey Lodge Occult Review website. 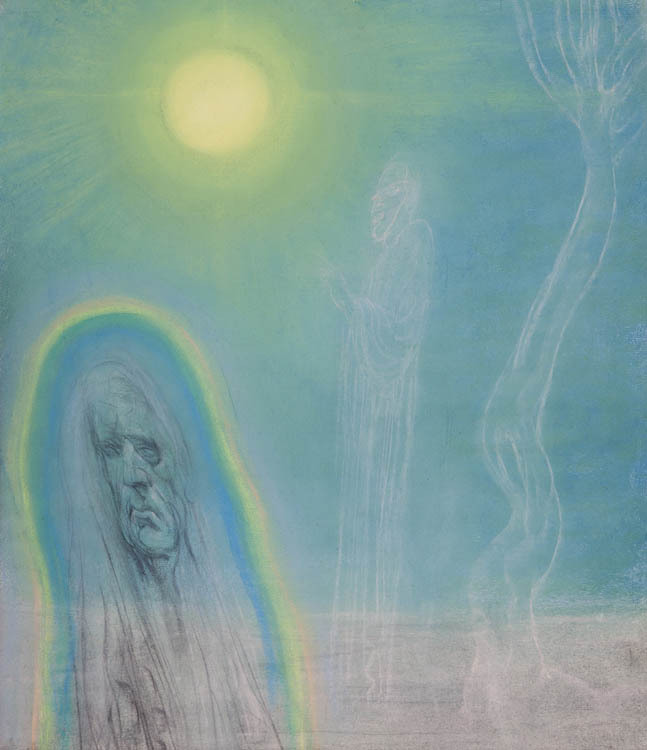 Within the dream he was searching for some rare editions of Spare’s work, hoping to get deeper into the mysteries of Spare’s actual practice and learn more about the techniques that made him one of the greatest visionary artists of the 20th century. While standing in front of a book shelf filled with antiquarian tomes, Metcalfe’s dream self looked up and noticed a long queue leading towards a desk, behind which sat a thick bodied and able man, of indeterminate age, yet obviously past his mid-forties as his hair was noticeably whitened and his face weathered with the wisdom of age. The man was wearing the comfortable tweed and thick sweater of a classic antiquarian, an outfit which was fittingly worn at times by Spare himself. And with that, Metcalfe awoke. This odd and resonant dream encounter has been a guiding light in our investigations of the outer edges of society and mind. Rather than place any undue relevance on the cause of the dream or any significance beyond the message itself, we have allowed this recommendation to percolate and suffuse our research practices over the years. Now that seed, planted so long ago in a semi-lucid dream, presents us with a flower of sorts in our current experiment in de-conceptualization and increased activity in our research efforts. In a particularly poignant irony, we have developed a strong relationship with Fulgur Press over the past few years, and have found that practice truly does go beyond reading when the intentions are pure. With all of this in mind, we are incredibly happy to offer up this limited edition print as a seal on a dream message received and acted upon! The print that we have is #34/65 , and comes complete with the original certificate of provenance. A similar print was sold recently on Ebay for $750 (£457.99) and we are asking for $400 as the print that we have is currently unframed. If this weren’t part of our year end fundraising campaign, we’d ask for significantly less, but in order to continue our self-funded research efforts we are taking the market into consideration for this sale. We would ask that the purchase be conducted via Paypal, and unfortunately cannot at this time consider alternative methods of receiving funds. For further information or to inquire about buying this fantastic print of one of Austin Osman Spare’s striking creations, please contact our Managing Director, David Metcalfe via email at: davidbmetcalfe @ gmail dot com.